Channel your inner indigenous goddess with tonics and elixirs made from plant-based ingredients. How did Cleopatra and queens of the Amazon stay so radiant? We like to think it was a kit like this. 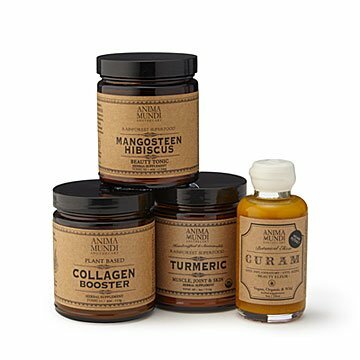 Each blend is formulated using techniques of ancient botany— that means plant-based, wild-foraged ingredients from small farms in Central and South America, as well as India and Thailand. Channel your inner global goddess with a mangosteen and hibiscus tonic, or an elixir made with turmeric and ylang ylang flowers. It's a four-piece set for all the natural beauties in your life. Developed by Adriana Ayales. Handmade in Brooklyn. Originally from Costa Rica, herbalist Adriana Ayales brings ancient remedies to the modern world. “My heart was to create a true farm to pharmacy experience through the art of medicine making with herbs,” she says. Her remedies incorporate plants from traditions she’s studied over the years: rainforest tribal rituals, Ayurveda, Chinese-Daoist medicine, and European-style alchemy. “I believe that by preserving these ancient forms of indigenous botany, we keep alive a very sacred aspect to our source.” She lives and formulates her botanical blends in Brooklyn.